It’s that time of month again when all the Designer over at Elizabeth Craft designs join together to create projects around one central theme or product. This month the theme is “All that Glitters” to celebrate the release of the three new Microfine Glitter Palettes. Make sure you jump on over to the ECD blog to see all the amazing things the Design Team has come up with. Trust me, you don’t want to miss this! And anyway, there is a couple of gift certificates up for grabs over there just by answering this month’s question on either the blog page or in the Facebook group! All you have to do is answer the question: Which of the new Silk Microfine Glitter Palettes is your favorite, Earth, Beach or Bloom? This month, I have sort of gone glitter crazy to create my beach side paradise along with one of the new dies from Joset’s recent release! To create this project I started by laying down some 5×7″ double sided adhesive over some White 80 lb Soft Finish Cardstock and then die cut the the page with Stitched Squares die set. Then using the Earth Palette Microfine Glitter, I free handed the background, trying to create a foreground and background of sand using the rich red and copper bronze. I then create a line of ocean in vintage teal and a skyline with the ice teal. I then added the glittered panel to a 12″x 6″ folded sheet of Dusty Sky Soft Finish Cardstock using some 6mm double side adhesive. Using the brand new Palm Trees die set from Joset’s new line, I die cut out the pieces. I once again had covered some white soft finish cardstock with a sheet of double side adhesive so that I could add glitter to the palms, hammock and coconuts. I cover the palm leaves in leaf green micro fine glitter, the hammock in royal blue, and the coconuts in copper. I die cut the trunks to the trees out of some goldenrod soft finish cardstock. Then using my copics (E33 and E35) I added some shading to the trunks. Using some double side adhesive, I added the tree trunks and the hammock to the card. The palms were added with some three dimensional tape so they would pop up a little in the center. I added the coconuts to the palm and then covered both them and the hammock with some glossy accents, because lets be honest, you need a little shine with all this glitter. Finally, I added a sentiment with some versafine black ink from the Love Sentiments stamp set. I added a touch of highlight to the words with a white gel pen. I hope you enjoyed seeing how I played along with this month’s Designer Challenge. 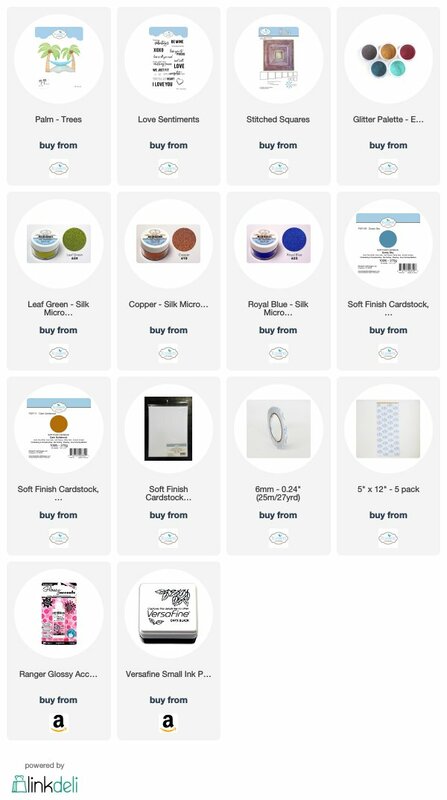 Make certain you jump over to the Elizabeth Craft Designs Blog to check out all the fun going on! I love the card. Thanks for sharing your glitter technique. The colors are so beautiful and vibrant.